If you are local to the Orange County, CA area, please join us at our office location for a small group. Are you trying to manage the storm of addiction? Do you feel worn down, tired and unsure where to go? Breaking Point is an intervention program designed for family members to be empowered and equipped with tangible solutions. This material will help you to assess, understand and get the help you need to stabilize the situation and make decisions that will move you away from crisis and into a plan. A personalized program is available upon request for an additional fee. Cost is $10 per class, but scholarships are available. The Christian Codependence Recovery Workbook: From Surviving to Significance is a spirit-led process of self-confrontation and truth-finding where we will be able to dig deep into harmful patterns and belief systems that have “blocked” us. At the very same time, we will learn the radical and perfect relationship skills formed by our Creator, God. This will enable us over time to find balance, healthy boundaries and move into authentic identity. We request a donation of $10/workshop to help us maintain these services. This workshop is led by a certified professional Christian counselor and is treated similar to group therapy as opposed to strictly a recovery meeting forum. If you cannot afford to donate, please let us know so we can accommodate you. Materials are required to be purchased! A new workshop is coming in 2018! Please check back for more information! 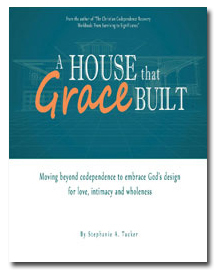 A House that Grace Built is an application driven process that takes codependence recovery to a deeper level, allowing us to utilize the spiritual resources we need to live this life as God intended. It is truly about building a life that is based on God’s design rather than survival. Our workshops are free of charge. However, we ask a donation of $50 or more be made, which will include the book. You will receive an e-mail with the download of the application companion workbook for free upon registration. The donation isn’t requirement, but helps support our organization and allows us to continue to offer services to the community (we are a non-profit 501-3c organization). If you cannot make a donation or can only share a small amount, please remember to purchase a book for $15. They will be available on the first day. When registering, you can choose “Paid” or “Unpaid” options. The paid allows you add a donation before you register. The unpaid allows you register without a donation.